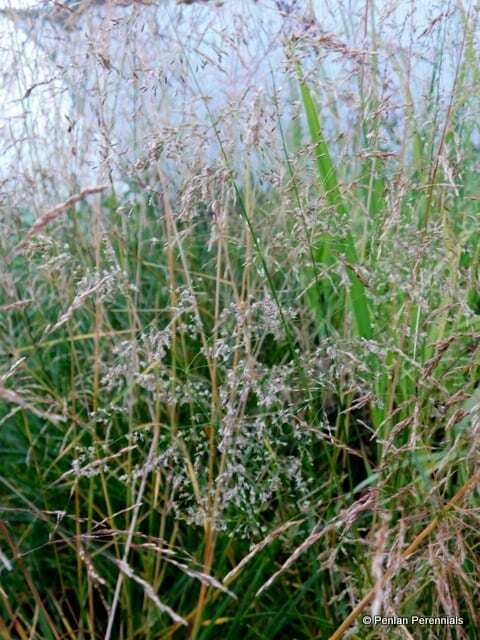 This tufted hair grass enjoys a moist but well drained soil and the narrow, leathery, dark-green leaves form a neat tussock. The flower spikes are feathery panicles of silvery-purple flowers held clear above the foliage on arching stems. It cuts well and looks tremendous in any winter frost. This is one of the few ornamental grasses that grows well in moderately shady locations, however it will not flower well if moved into deep shade. Semi-evergreen foliage may retain some green colour in a mild winters and it can self-seed in optimum growing conditions. Hardiness H6. Pot size 1.5 litre. Cut to the ground in early spring as new shoots appear. Propagate by division in spring.